When buying a meat slicer you need to consider what kind of use you will be putting it through. Lighter Duty Slicers will feature smaller blades. The horsepower is designed for lighter daily usage. This is considered to be 1-2 hours a day at the most. The medium-duty models can handle 3-6 hours a day and the heavier duty models can be used constantly throughout the day. Their horsepower will correspond to how much work they do. Some medium-duty models and most heavy-duty models can be used not only for cutting deli meats and vegetables but even hard cheese as well as frozen food. Most manufacturers make models that have a removable food tray. Some even design their slicers to be taken apart all together for superior cleaning. are important features that will keep the slicer operators safe. For commercial applications look for NSF markings. Slicers are built as either belt driven or gear driven. Gear driven slicers are supposed to last longer because the gear mechanisms are sturdier. The downside is that the cost of repair is higher than belt driven models. A belt drive may not last as long, however, it is durable enough. It is the most common drive type even in the premium high-end slicers. If it breaks down the cost of repair is not as high as the gear drive. Another thing to consider with construction is if you want an automatic or manual slicer. Like the name implies automatic slicers can be set to do the back and forth slicing motion without an operator present. This is ideal in large volume operations. Automatic slicers can be toggled, in other words, they can be used as either automatic or manual. Manual slicers have to be operated by an operator. Manual slicers are used more across the industry vs automatic slicers. There are two types of slicing machines: manual and automatic. Depending on your needs, products, and volume, you’re likely to opt for one machine over the other. Staff must propel the product tray over the blade to slice the product manually. Best for lighter use, small volumes of product. An electric motor propels the product tray back and forth, cutting out the labor of moving the tray by hand. You can operate these as manual slicers as well. Best for large volumes of product, constant slicing needs, large delis, supermarkets. Because of the innate and vast differences between manual and automatic slicing machines, this guide is broken down first into the intricacies of automatic slicing machines and then into manual slicing equipment at the end. To understand which model may be best for your operation, it’s important to understand all of the working parts of a slicer, as these parts can have a huge impact on what you’re able to slice. Product Table: Known also as the carriage or product tray, the size of this area can vary drastically, impacting the sizes of items you’re able to place on the slicer itself. While most carriages can hold items that are 7 ½” - 12” in diameter, always verify before purchase if you’re planning on slicing items with larger diameters, as some simply cannot accommodate larger size items. Pusher: Also known as a grip or meat grip, the pusher holds food items in place for safer slicing. Keep in mind that many of these are removable for easier cleaning. Gauge Plate: This area moves when you’re adjusting the thickness control knob. It surrounds the knife and allows for different thickness slices for your products. Sharpener: The built-in blade sharpener keeps your cuts razor-sharp and can be removed for easy cleaning. Blade and Blade Guard: The blade is what bears the brunt of the work for your slicer, and the blade guard keeps fingers safely blocked from the sharp edge. While the guard is removable for cleaning, many blades are permanent fixtures (depending on the model). Sizing: While a 12” blade is standard industry size, there are other size blades available as well (the guideline below isn’t set-in-stone, so check your slicer’s specs before purchase). As the name implies, these slicers are built for lighter uses of only an hour or two a day. The design is simplistic yet safe, but if you’re looking to slice difficult items like cheese, then stay away from these models. While these may be cheaper, they’ll burn out quickly if used beyond their intended capacities. Best for light use, deli meats, 1-2 hours/day use. Built with larger blades and more horsepower, these are built for slightly more use than entry-level models and can slice cheese on occasion. Best for deli meat, veggies, 3-4 hours/day use. As the top-of-the-line option, premium slicers can handle delicate items like cheese and constant, heavy-duty, daily use. Best for deli meat, veggies, cheese, consistent use. Horsepower: Higher horsepower is best for more frequent use, so you’ll find that the premium models typically have the highest horsepower. Cleaning Leg/Kickstand: This feature props the slicer up for access to underneath the carriage for easier cleaning. 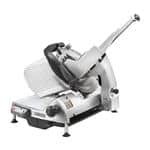 No Volt Release: If your unit gets unplugged during operation or unplugged for cleaning, this safety feature requires the user to push the power button to restart the slicer. Gauge Plate Interlock: As an added safety feature, the gauge plate interlock requires the gauge plate to be set to zero before being moved or tilted to protect the blade and the user’s fingers. 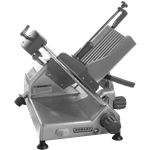 In addition to the standard ‘meat slicer’ (which is typically a misnomer, as these slicers - as stated above - can also slice veggies and cheese), there are specialty slicers to consider as well for certain operations and products. Bread slicers are specifically designed for slicing loaves of bread or bagels into halves. These are available in both countertop and floor models. Consider these slicers best for bakeries, delis serving fresh sandwiches, and supermarkets that bake bread on-site. Choose between countertop models for smaller operations or smaller outputs, or opt for a floor model for kitchens with a large emphasis on bread products. For kitchens that don’t have large volumes of product that needs slicing, it’s best to opt for manual slicing equipment over automatic slicing machines. These pieces of equipment handle light loads and typically take up less space in your kitchen. Simplistic in design, these slicers are built for single products like a hard-boiled egg or single strawberry, allowing the user to slice small portions for salad toppings or accent garnishes. Best for eggs, soft produce, single-servings, garnishes. 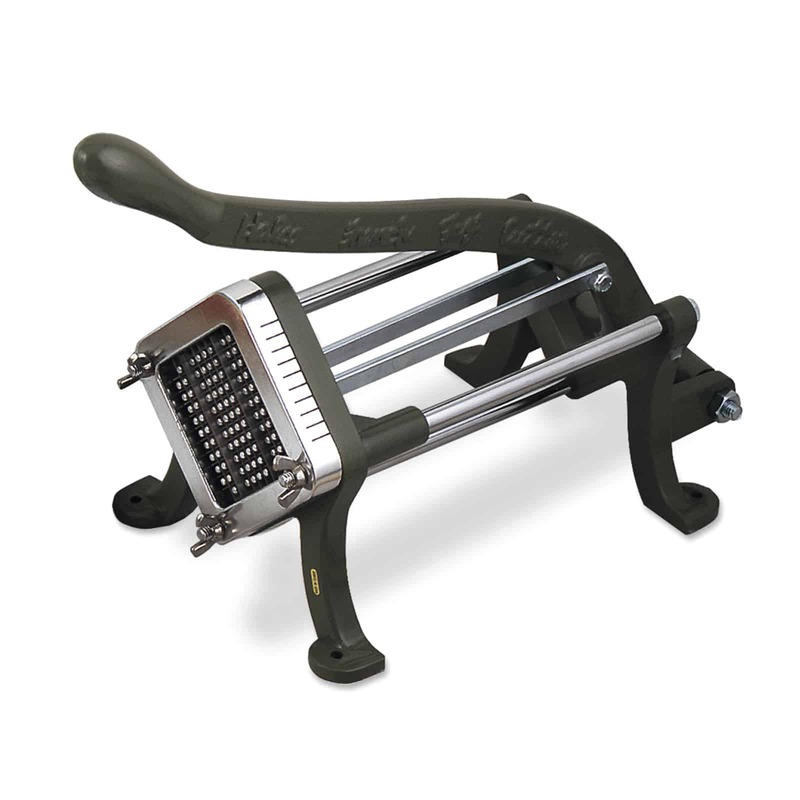 With a simplistic design, the mandolin slicer is great for slicing small amounts of products for special needs like sandwich toppings or even for plating decor. These are not intended for high-volume uses. Best for small volume slicing needs, decorative slices of veggies, sandwich toppings. 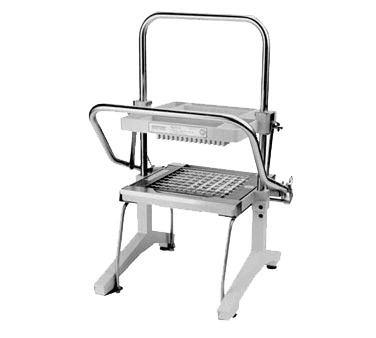 While this category is generic, the slicers differentiate themselves from the standard meat slicer in that their primary purpose is to slice bulk amounts of soft fruits and veggies like tomatoes. Some larger models can accommodate slightly tougher produce as well as some cooked chicken, making it ideal for cafes with salads and sandwiches. Best for café, sandwich shop, deli. If you prepare a lot of sliced tomato product, then perhaps a tomato laser slicer is the right tool for the job! 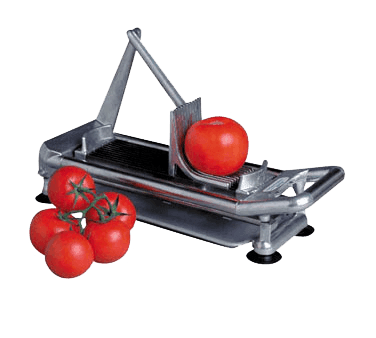 These have removable stainless steel blade cartridges and staggered blade slicing systems specifically designed for slicing tomatoes. Best for small volume outputs, tomatoes. As the name implies, these units are ideal for cutting perfect french fries, making them an essential for any fast-casual eatery with fresh cut french fries dominating the ‘sides’ selection. Best for fast-casual eateries, diners, french fries. While these units can accept smaller produce, the carriage can also enlarge to suit items up to 6 inches high, making these great for large heads of lettuce. Best for diners, restaurants, lettuce, produce. Note that the purchase of a freestanding slicer unit isn’t always appropriate for those who have smaller setups or smaller requirements for their slicer. These HUB attachments are available in a variety of slicing options, giving users the versatility to change the output to accommodate different sliced-good.